Being Human creator Toby Whithouse has been one of the more reliable Doctor Who writers of recent years. Look at his four previous episodes, for the Tenth and Eleventh Doctors – while none of them push the boat out too far, they all have engaging plots, an interesting angle on their leads, and well-developed side characters. They’re all episodes that I’d happily rewatch on a lazy Sunday, were my timetable organised enough to allow weekends to actually mean anything. Whithouse's latest story, the two-part Under the Lake/Before the Flood, looked set up to be much the same, taking on a very classic Who trope – the base under siege. Specifically, the Drum, an underwater mining facility on the site of a flooded military training town. The Doctor and Clara show up shortly after the crew have salvaged a mysterious spaceship, leading to the haunting of the corridors by the souls of the dead. It's a ghosts episode! Cue lots of running around corridors. And I do mean a lot of corridors; this episode feels very visually restrained compared to series nine’s blockbuster opening. I personally found the ghosts not particularly scary, rather lacking in intensity, but maybe I’m just a tough nut to crack… I did like how they use objects from their environment as weapons rather than some ethereal power, which on the one hand allows for some grisly deaths, but on the other hand leads to the considerably less effective scene in which a ghost threatens five fully-grown adults with a plastic chair. Nevertheless, Whithouse keeps the plot moving steadily along, with the second half of the episode seeing the Doctor take control of the situation and lead an investigation into the ghosts’ nature. I’m a sucker for the ‘sci-fi Sherlock Holmes’ stuff, and so, even if I do question whether Orion's Sword really does look like a a sword from any point in space, I did enjoy this building up of the mystery; Peter Capaldi seems to relish these deduction monologues, well suited to his more intellectual and authoritative Doctor. What I also liked was the way Whithouse handles the Doctor and Clara’s relationship, telling us more about where they’re going this series in one opening scene than Moffat did in two whole episodes. 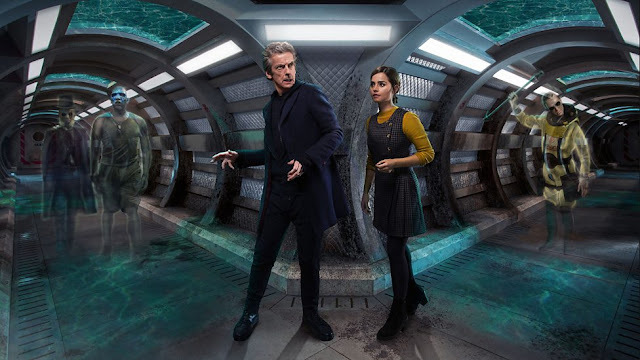 Clara’s eager to run off into adventure and is reprimanded by the Doctor, who foresees the danger of her becoming too much like him. 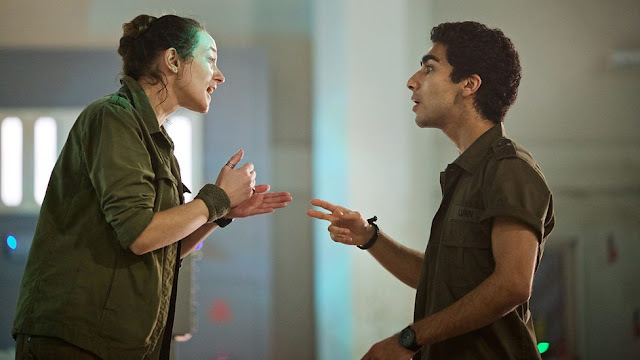 Rightfully, she tells him off for being a grumpy hypocrite, but the seeds are being planted for this series’ character arc – seeds which probably should have been planted in the opening two episodes. It’s also great to see them having fun together, and Whithouse sprinkles in humour that feels right for the characters and not over-the-top, yet is genuinely funny – the Doctor’s “Was it something she said? She does that” upon being attacked is lovely, and if you haven’t rewatched the scene with the cards yet and paused at each one, go and do so now. It is a disappointment that some of the side characters are less well developed, given that this is usually one of Whithouse’s strengths (and Moffat rarely bothers with side characters at all these days). Pritchard is a very typical money-above-safety executive, and I’m not sure who Bennett is other than that he’s a bit more scared than the others. On the plus side, I really liked Cass, and think it’s great that there’s a deaf character in charge of the base, and not defined by her disability. 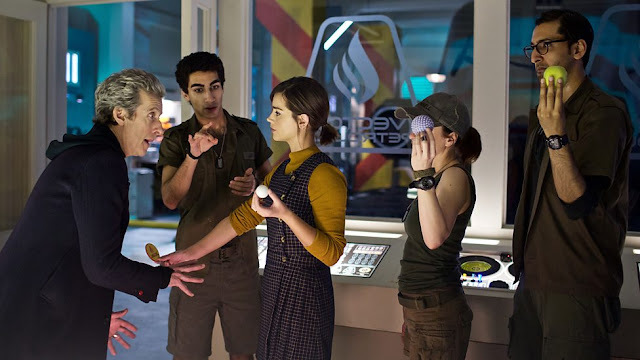 Indeed, the Doctor describes her as the smartest person in the room, and the only time her deafness is relevant to the plot, it allows her to help solve a problem (lip-reading the co-ordinates) rather than being something that causes one – all of which must have been amazing for any deaf children watching. On a less positive diversity point, two stories in a row have featured the same unfortunate trope literally in their opening scenes. Whoops. And so, to that cliffhanger – if you didn’t see it coming, go and stand in the corner. It does seem a bit soon after the last time the Doctor was doomed to die, doesn’t it? It’s only been, what, one story? Still, it’s a cliffhanger that encourages detective work – obviously he’ll get out of it, but how? That week spent theorising is one of the things I enjoy about two-parters, and it’s good to have it back.